Could Teddy Bridgewater and Bill O'Brien be teaming up with the Texans in 2014? A few hours before the second piece of great news for Houston played out on national television, the first swirled around the Internet. 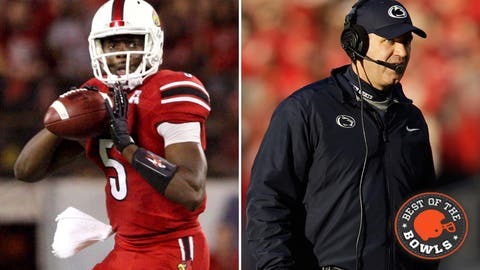 Out of the East came word that the Houston Texans are “working on an agreement” to make Penn State’s Bill O’Brien their next head coach after firing Gary Kubiak earlier this season. O’Brien claims he’s staying at Penn State, as one Nittany Lions recruit says he’s been told, and luckily no coach has ever been anything less than truthful with recruits regarding impending job offers. Meanwhile, later in Orlando, Louisville quarterback Teddy Bridgewater was busy crushing the Miami Hurricanes in the Russell Athletic Bowl 36-9. Bridgewater set a career-high with 447 yards passing, while completing 35-of-45 throws, and added three passing touchdowns and one rushing score. He added and subtracted velocity on throws when needed, showed beautiful touch, displayed pocket awareness and mobility, made plays with his legs when his progressions stalled — Bridgewater showed off everything that has led many NFL Draft analysts to believe he’s the top talent in the 2014 class and worthy of the No. 1 overall selection, which currently is the projected property of the Texans. Word spread that Texans general manager Rick Smith was in Orlando to watch Bridgewater, and by then it was madness. It didn’t matter that Bridgewater has yet to officially announce he’ll be entering the draft. At one point in the fourth quarter, Rod Gilmore, the color commentator on the bowl broadcast, tried to make even a semi-feasible case for Bridgewater returning to Louisville for a fourth season, and it consisted of two points: 1) enjoy one more season with the classmates you came in with, and 2) get a little stronger and more physically prepared for the NFL. Of course not, because the very definition of insanity is Teddy Bridgewater returning to Louisville to play more football. Bridgewater, at a listed 6-foot-3 and 196 pounds, does need to add some strength and could be better physically prepared for the pro game, but degrees of readiness almost always fall second to degrees of business sense in these draft decisions. Having earned his degree from Louisville this month, Bridgewater is in an even better position than most juniors who must decide between turning pro without completing their education or coming back and hoping the same opportunity will present itself in a year. Yes, it was a thrill to watch Bridgewater at Louisville. He helped the Cardinals get to three bowl games in his three years on campus, which included a thorough beating of Florida in the Sugar Bowl last season and Saturday’s win over Miami. He helped make Charlie Strong a name worth watching on the annual coaching carousel. He helped make Louisville a viable football program as it heads to the ACC in 2014. Bridgewater gave us a great show, leaving college football wanting more and the NFL waiting for its first serving next fall. It’s coming, seemingly along with Bill O’Brien, and damn it must feel good today to be a Houstonian.